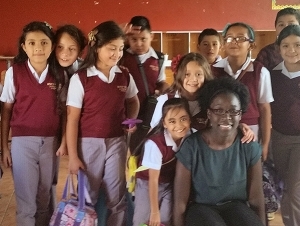 The summer after she completed her literacy specialist master's degree, Crystal Holmes-Smith, '15, '16, accepted an offer to teach fourth and fifth grades at Moriah School in La Esperanza, Honduras. As she teaches English, science, and mathematics, she also studies the Spanish language and develops her classroom methods. Holmes-Smith said that Buffalo State contributed greatly to her personal development by helping her build confidence and leadership skills. As an undergraduate, Holmes-Smith collaborated with student government and worked closely with Buffalo State’s Professional Development Schools Consortium. She also engaged heavily in undergraduate research—earning a summer research fellowship and presenting on campus and at national conferences such as the National Association for Professional Development Schools. Two study-abroad opportunities also influenced Holmes-Smith. In 2015, she traveled to Chile where she observed and taught. In 2016, she traveled with the Anne Frank Project to Rwanda to take part in a drama-based education program. Both trips allowed her to build friendships, stretch herself as a teacher, and examine the joys and struggles experienced across the globe. Holmes-Smith believes that campus-led travel abroad is something all students, especially teacher-education candidates, should make part of their academic plan. “All of these experiences, both abroad and on campus, made me challenge myself and try new things,” she said. “I developed an appreciation for different cultures, which helped me become a more culturally responsive teacher.” Her next stop begins in August 2017, when she will serve as a Peace Corps volunteer co-teaching English as a foreign language in Nicaragua. Holmes-Smith said that, at Buffalo State, she learned what it takes to succeed in both a career and at life: a love for what you do, hard work, dedication, and a willingness to continue learning. Read more about education students and alumni.